Somewhere off the south Devon coast, funeral director Joseph performs a sea burial. Nearer to shore, Coroner's Officer Clint is surfing when he spots an unrecognisable bloated body on the beach. The Coroner was broadcast on ABC1 at Thursday 22 November 2018, 01:44. 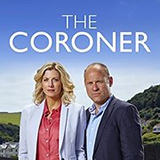 The Coroner is a British daytime drama series consisting of 20 episodes and revolving around Jane Kennedy, a coroner in the fictional town of Lighthaven in South Devon. Jane works together with Davey Higgins, a Detective Sergeant in the local police department and her childhood sweetheart who broke her heart. Together they investigate unusual homicide cases. The Coroner combines both drama and humour, which is considered one of the reasons for its success. The main characters, Jane and Davey, and their relationship are inspired by the characters of Katharine Hepburn and Spencer Tracey in the movie classic "Adams Rib". Filming of the series took place in and around Devon, Great Britain, including popular coastal towns like Dartmouth, Torquay and Paignton.